It's not my style to harp on an official having a bad night, but there seems to be such a rash of them lately that I thought I'd point out the very real aspect of how to respond from an off night, if it's possible. The boxing community has spoken quite loudly over the last several weeks in regard to referee Russell Mora, New Jersey's boxing judges, and to a lesser degree, ring vet Vic Drakulich. I'll start off with Drakulich because he has not been on the hot seat the way the other officials have, I merely point out Drakulich because last week, his name has appeared in the spotlight once again because Zab Judah and his promotional company have filed a protest with the IBF for there percieved notion that Drakulich did not handle Zab Judah's match properly with Amir Khan. While I'm in agreement with most who feel Drakulich was correct in his ruling, I think it's worth noting because of how Drakulich handled his next assignment. On July 23, Judah, and his clan made claims that Judah was hit low, which caused him to suffer a TKO loss to Amir Khan. While most feel that Drakulich was spot on with ruling of a legal blow delivered by Khan, I thought it was a bit strange that the following week, Drakulich went the opposite way in his ruling of the Edison Miranda-Yordanis Despaigne match. While Judah complained of a borderline shot that Drakulich overruled, a very similar situation arose in the Miranda-Despaigne match. It was just six(6) days after the Judah match and Despaigne also complained of low blows. The fact is Despaigne, a highly touted Cuban star, with just one loss complained enough that referee Drakulich disqualified Miranda for repeated low blows. I point out complaining because the shots that Despaigne complained of were not low, they were on the belt line. His constant complaints of a low blow worked because Drakulic decided that the shots were low enough and halted the match in the 5th round, the same round he counted Zab Judah out in the Amir Khan match. From the videos that I watched, I don't believe that Despaigne deserved anymore consideration than Judah, however, in this age where many boxers complain of borderline shots, I believe Despaigne took the easy way out. What's interesting in that match is Miranda, who is known as a hard puncher did not appear to deliver any debilitating shots that Despaign constantly griped about. As for Referee Russell Mora, I'll just say he had a bad night. He's admitted as much in the days following the Joseph Agbeko-Abner Mares matchup, and while I'd like to think that that is just part of what happens in boxing, it rarely happens on this stage with a veteran official like Mora. Nevada has a stable of veteran officials, led by Kenney Bayless and Joe Cortez, followed by a strong cast in Tony Weeks, Robert Byrd, and Nady. Mora is Vegas' newest addition, although not a novice to the sport. 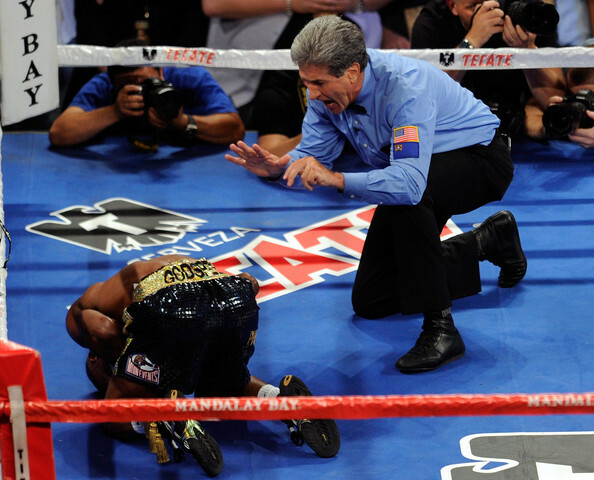 Mora has been a professional referee for fourteen years, but in Nevada for the previous three. I have watched Mora closely, as I've watched every referee who works in the trade that I continue to learn in and I could not have predicted the horrible night that has plagued Mora for the previous three weeks. Commissioner Keith Kizer has stated that he will bring Mora back slowly, while having his group of veterans work closely with Mora. Sounds like a good idea, so I hope Mora bounces back with the same promise that he exhibited a few years ago when he first arrived in Nevada. What may be tough on Mora is the backlash from fans once he's introduced as the referee of future boxing matches. It was in the same state that famed referee Richard Steele was constantly jeered by fans after his controversial decision to stop the Meldrick Taylor-Julio Casar Chavez match in 1990 with two seconds to go in the fight. Steele followed that up with another questionable stoppage in the Mike Tyson-Donovan "Razor" Ruddock battle in 1991. Steele was hammered by fans in nearly every subsequent fight when his name was introduced; I believe Mora should expect the same type of treatment. It was shortly thereafter that Steele retired from the sport for nearly ten years, before embarking on a short return to the ring in which he was still not well recieved by the fans. I don't know how much stress the fans put on Steele, but I would assume it played a part. In the 1982, one of Nevada's fine referee's, Richard Green was the third man in the ring for the Ray Mancini-Duk Ku Kim match. It was a very brutal fight, in which both guys took an inordinate amount of punches. In the era of the 15 round match, Mancini stopped Kim in the 14th round, in an outdoor battle, which saw the South Korean boxer fall into a coma and pass away just four days after the match. This was followed by Kim's mother committing suicide four months later; and referee Richard Green taking his own life less than a year after the match. Although Green was not criticized for any wrongdoing, he may have felt some guilt in being the guy in the ring when such a tragedy took place. Referees are human beings and we often are the most critical of ourselves when we feel we could have done a better job(I thought Green did a fantastic job, that just had an unfortunate ending). I can't imagine the thoughts that must have raced through his mind, following the match, but I'm sure Kim's mother taking her life did not help Green's recovery process. While this is an extreme version of what can happen with a referees' psyche, referees, like boxers have to have short memories, following bad nights. The more you dwell on an off night(we all have them), the more it effects your judgement the next time you are in a similar situation. Nevada referee Mitch Halpern was one of boxings' most promising referees in the year 2000 when he suddenly took his own life as well. While Halpern, who had officiated nearly 100 title matches at the ripe old age of 33, by all accounts, Halpern took his life in a domestic dispute with his fiancee. Pointing to the time frame of his suicide, it is probably not related, but Halpern took his life just five months after a very small percentage of pundits criticized him for allowing David Reid to continue against a dominant Felix Trinidad. A fight that was competitive until the final three rounds, ringside commentator Ferdie Pacheco is lambasting Halpern for not stopping the match in round 11 after Reid went to the canvas three times. While there will always be critics, I believe you have to have thick skin when officiating because, like the boxers, there will be another night. I believe you have to go back 20 years to Richard Steele to find the type of public outcry that has followed Russell Mora and his mishandling of the Joseph Agbeko-Abner Mares match. Although criticism comes with the territory, I believe you have to maintain a certain level of arrogance to bounce back from such a rough night. I don't know Mora personally, but I imagine it won't be easy. He had pressure going into the match, as Don King protested Mora's assignment, stating that Mora is a Golden Boy referee. Not sure how he concluded that, but he certainly seems somewhat prophetic in the aftermath. I don't know if Mora carried any of that prefight drama into the match, but whatever he may have carried, he can expect to carry a lot more from this point forward.